This is a post written by well known Pakistani Author and Cook, Sumayya Jamil and is a result of our mutual interests in the various influences on cuisines. As we have previously written about, there is a huge Arabian influence on Spanish cuisine, as a result of nearly 700 years of occupation by the Moors. Many other countries have also been heavily influenced by the Arab conquests, including Pakistan, and through our conversations with Sumayya, we thought it would be interesting to experiment and compare how the same ingredients, introduced to different countries by Arab invaders, are used in their respective cuisines. The plan: To take the same 5 ingredients, ingredients that as a result of occupation were introduced to Spain and to Pakistan and for us each to cook a dish to compare how these ingredients are used in present day cooking. You can read the sister post to this one on Sumayya’s site and see our recipe for Figgy Bread Cake with Sweet Saffron Yogurt. Pakistan’s cuisine is so very different and far removed from that of Spain’s. One would never consider that there are some underlining ingredients that are similar given the recipes and dishes are so different. Much of Pakistani cuisine is influenced by Persian, North Indian, regional Pakistani and Arab cuisine. The Arabs invaded India through Sindh (which is now the Southern part of Pakistan) around 712 AD, bringing with them their love of meat, pomegranates, sweet halvas, subtly aromatic spices such as saffron and the use of nuts and dry fruit in food. When one looks at parallels in history we find that many of these Arab culinary influences are found in Spain as well. The Moorish people from North Africa, with their Arab and Berber heritage, who had invaded Spain in the early 8th century and occupied Southern Spain for 700 years, left a lasting mark on the Spanish cuisine and on the cuisine of Andalusia, especially. Items such as pomegranates, figs and saffron feature in many Spanish dishes and are exactly the flavours that also spring up in Pakistani cuisine. I decided to make a very Arab influenced dessert called halva – a dense sweet confection made of many things, found in various countries, always taking on an indigenous flavour no matter where it is found. From the Middle East to the Balkans – Halvas is that one comfort food that reminds you of your grandmother’s cooking, warm hugs and all things rather perfect. 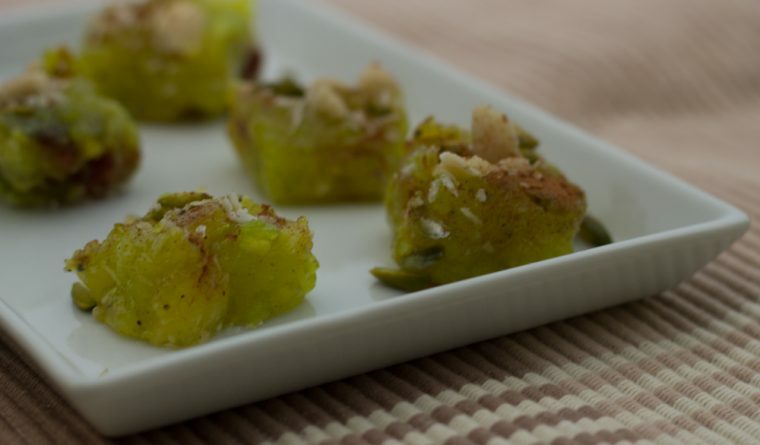 In Pakistan, we make halvas out of just about anything – from vegetables, fruits, nuts, semolina, lentils, flowers – and one such curious invention is that of Karachi Halva – from the city I grew up in. It resembles Turkish Delight, in its spongy translucent appearance and its texture, which is rather chewy. 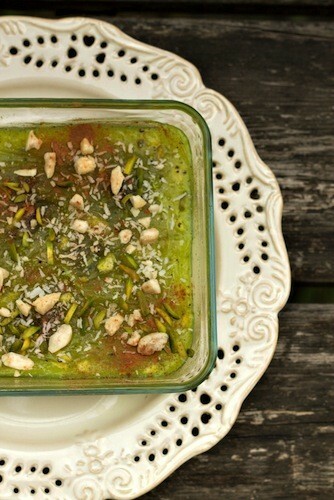 This recipe is a celebration of the Arab culinary influences in Pakistani cuisine and is my version of Karachi Halva. To me this brings together the best influences of Arab culinary ingredients and local Pakistani sweet making methods. Any Halva reminds me of cheeky afternoons biting into a piece of these sweet delights, slowly savoured over a hot cup of Chai and some heart warming conversation. Add half the water to a bowl with the cornflour and whip into a smooth lump free paste. Add the rest of the water to the sugar and stir. If the cornflour still has lumps, sieve through a muslin cloth. Stir constantly so as to avoid lumps from forming. When it all comes together, add the lemon juice and continue to stir. Add about half the ghee slowly, while stirring the mixture continuously. When the mixture starts to come away from the pan add the remaining ghee and allow it to be incorporated. Finally, add the cardamom, nuts, dates and saffron. Transfer into a square or rectangular glass container or tin that has been lightly greased. Smooth down and let it cool. Once cool, cut into squares and serve with a dusting of ground cinnamon, coconut and a few left over nuts and a drizzle of honey. Store in a fridge for up to 5 days. Enjoy at room temperature.